There is plenty of buzz about the New York Giants potentially selecting Ohio State quarterback Dwayne Haskins with the sixth pick in the NFL Draft. The team's biggest decision-makers received up-close looks in recent days. Much of the team's top brass -- including head coach Pat Shurmur, offensive coordinator Mike Shula, senior vice president of player personnel Chris Mara -- took Haskins to dinner Tuesday night and then studied his on-field drills at the Buckeyes' Pro Day on Wednesday. 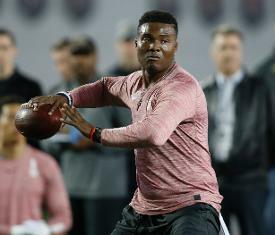 Haskins could be the choice if New York is ready to try to draft the replacement for Eli Manning, but there could be competition as other quarterback-needy teams assess their draft position. Haskins said he would soon meet with the Oakland Raiders (who hold the No. 4 pick), the Denver Broncos (No. 10), the Miami Dolphins (No. 13) and the Washington Redskins (No. 15). "All my NFL friends tell me it's not how early you go, it's where you go," Haskins told ESPN on Wednesday. Haskins is widely considered one of the top two quarterbacks available, along with Oklahoma's Kyler Murray, a potential No. 1 overall pick. Haskins' best features are his pocket-passing skills, decision-making and arm strength, while Murray has electrifying athleticism (and quite a good arm, too). Haskins ran an official 5.04-second 40-yard dash at the NFL Scouting Combine. He hoped to counter criticism of his straight-line speed with quick footwork at the Pro Day. "You put me in any playbook, I'll make it work," Haskins said. "So, to be able to show off-platform throws, moving to my left, moving to my right, being able to move off spot and still be accurate, is what I wanted to show because during the season I had a couple of throws that I missed that I still remember and I worked on all offseason. "I definitely felt like I did a good job with that." Haskins threw for 4,831 yards in his lone season as a starter at Ohio State, working almost exclusively from the pocket. Said ESPN draft analyst Todd McShay: "He's the most natural passer in this year's draft class."